The paper analyses the derivative and inflected asymmetries linked to the entry of the exogenous suffix –éri into Sardinian (Pinto 2011, 2015, 2016). Such asymmetries concern both word formation rules (e.g. : camp. N-ali, N-dòri, log. N-ale, N-dòre vs camp., log. N-éri) and productive nominal inflectional paradigms (e.g. : camp. N-I vs log. N-e, N-i).). The analysis considers the complex history of the outcomes of the Latin suffix -arius, in particular the Italo-Romance ones of French mediation (e.g. : tosc. –iere, –ieri < fr. –ier, cfr. Serianni 1995). The focus of the study is the role of the vowel -i which, in the case of –éri (< pis. –ièri, cat. –er, sp. –ero, it. –ière), does not serve as an isogloss between dialects from the south and the central-north (e.g. : camp. cani “dog”, log. cane “id.” vs camp. castangeri “chestnut seller”, log. castanzeri “id.”, cfr. Virdis 1988, Puddu 2015). A typological-comparative approach to the study of –éri in the Romance languages highlights interesting relationships between nominal inflection classes, gender and ways of forming the plural (pis. barbièri “barber, barbers” vs log. barbéri “barber”, barbéris “barbers”; cfr. Castellani 2000, Loporcaro 2016a, Maiden 2016). This paper picks out and describes some features of zoonyms in the historical cants of Italy. A sample of about one thousand words, taken from published and unpublished sources, is analysed, with respect to both its composition and the strategies used by cant speakers. The processes of lexical creation are then tackled, involving either the formal alteration of words or the reinterpretation of linguistic items from both ‘host’ languages (such as Italian and the dialects of Italy) and foreign languages (such as German and Romani). The economic crisis that emerged between 2007 and 2008 and the subsequent periods of recession (2009 and 2011) have long captured the attention of the Italian media. Economic crises are certainly not new to the West, nor are they to Italy; however, due to its exceptional intensity and duration, the last recessionary phase in our country represented a decisive moment in recent history. The study wants to set itself as a starting point for an overall analysis on the theme of the economic and (neo)liberal discourse in the media and in Italian politics. The corpus collected for this first survey includes articles of national newspapers published between August 2007 and July 2017, thus covering a vast period of time. The corpus is composed of about 300 thousand articles from 6 national newspapers (Corriere della Sera, Repubblica, La Stampa, Il Sole 24 Ore, MilanoFinanza) for a total of over 200 million words. The analysis will combine a series of quantitative and qualitative techniques; we refer here to the now consolidated field of study of Corpus Assisted Discourse Studies (Partington 2004). In the present paper we will focus on the description of some particularly salient social actors (the markets, the ECB, the workers) and on the concept of social class. A controversial interpretation of a text could ask textual critics of texts relatively ancient to choose between preserve and correct. Preserving, in a critical way, could be the right choice in textual restoration, but often textual critics choose to unduly emend according to modern language. It happens more often in rising philologies as the one applied to Sardinian poetic texts, where a philological school has missed and the period of Sardinian linguistic history from the 15th to 18th century is scarcely known. Through examples from the Sardinian poetic tradition (Antonio Cano, Francesco Ignazio Mannu, Pisurzi) the paper describes cases where the corrections are made not because of errors (assumed) but because of lectiones difficiliores under the linguistic angle, or becoming of such nature according to the modern perception. The process through which the textual critics make this kind of corrections is similar to the process that underlies to the transmission of texts where misreading and recoding confirm the concept of diasystem applied to textual criticism (Cesare Segre); in Sardinian case (as in others cases of bilingualism or various degrees of diglossia) the concept can be complicated by the stratification of different linguistic diasystems, consisting in the interference between Sardinian language and prestige varieties which it had been interacting with over ages. Orgosolo is a village located in the central Sardinia where the Sardinian language is still handed down from a generation to another and widely employed both in informal and formal conversations. Nevertheless, the linguistic contacts with other local varieties and, above all, with Italian determine frequent variations at phonetic, morphologic, morphosyntactic and lexical level, impacting on each speaker competences. 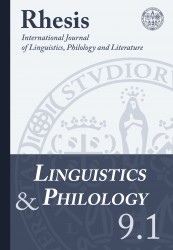 In this study, following a description of the contexts in which Sardinian and Italian are used, the most frequent phonetic, morphologic and lexical variations – pertaining both standard and less traditional vocabulary – will be analysed together with the impact of Italian language on speaker knowledges and competences, taking into consideration the most important sociolinguistic variables, in particular age, gender, education and profession.